According the the State of the Climate report, 2017 is the third warmest year on record. 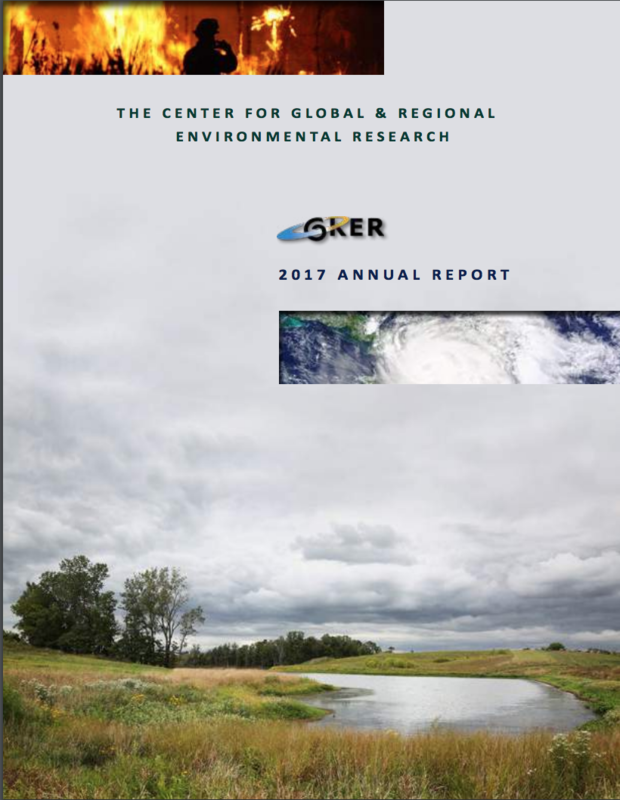 The annual State of the Climate report is published by the American Meteorological Society and is based on international data taken from land, air, and sea monitoring stations. 2016 still remains the warmest year on record, and 2015 comes in as the second warmest. The data from 2017 also reveals that last year, atmospheric greenhouse gas levels were the highest ever recorded. The average global carbon dioxide concentrations reached 405 parts per million. This far surpasses any carbon dioxide concentrations from previous climate data, as well as C02 concentrations found in ice cores from well over half a million years ago. The report also contains information about continued sea level rise, ocean surface temperatures, coral bleaching, and declining polar ice cap coverage. To read the State of the Climate in 2017, or any of the past reports, click here. 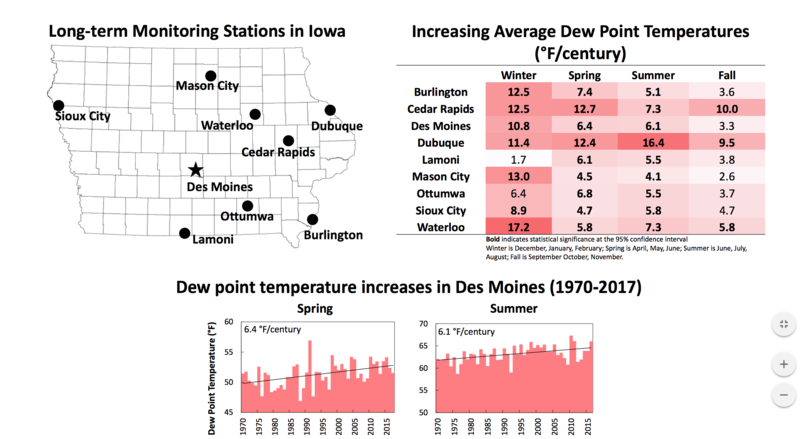 Two professors from Iowa recently contributed an article to the Des Moines Register about new climate change predictions for the state of Iowa. Gene Tackle, an emeritus professor of agronomy at Iowa State University, and Jerry Schnoor, a professor of civil and environmental at the University of Iowa and co-director of the Center for Global and Regional Environmental Research at the University of Iowa, wrote about the serious effects that climate change will have for Iowans, and how Iowans are already being effected. Schnoor and Tackle reference information from the from the Climate Science Special Report which is part of the National Climate Assessment Report. The report found that heat wave temperatures will increase to a range of 97-102 degrees by 2050. Currently, heat wave temperatures fall in a range of 90-95 degrees. These temperatures have serious consequences for vulnerable populations such as the young and elderly, as well as our agricultural interests in Iowa. Extreme weather events, such as the recent flooding in Polk County, have already demonstrated the danger of climate change we are facing today. Despite Iowa facing these grim predictions, Schnoor and Tackle urge Iowans that they can still take action. Supporting renewable energy, voting in local elections, and joining local organizations that spread information about climate change are all presented as important ways to help protect our future. A new study, conducted by a team from the London School of Hygiene & Tropical Medicine, studies the effect that consequences of climate change will have on the yield and nutritional content of vegetables and legumes. The environmental changes analyzed in the study include any change found in ambient temperature, salinity, water availability, and concentration of carbon dioxide and ozone in the atmosphere. The study complied information from 174 published papers, which utilized a total of 1,540 studies, and conclusions based on the information which encompassed data from 40 different counties. Variations of each environmental factor analyzed changed prospective vegetable and legume yields in different ways. For example, an increase in carbon dioxide levels was found to increase the mean yields overall, whereas an increase in tropospheric ozone concentration was found to decrease mean yields overall. However, an increase in carbon dioxide was the only factor studied that would produced an increase in mean yields, and all others were found to incur a decrease in average yields. The study could not make an overall comment about a change in food nutrition, but two papers that were analyzed found that an increase in carbon dioxide and ozone resulted significantly decreased nutrient concentrations within root vegetables. Vegetables and legumes provide many vital nutrients such as potassium, vitamin C, folate, and dietary fiber. They are cost effective diet staples for many people around the world. A decrease in means yields could negatively affect public health, decrease agriculture revenues, and make living a healthy life style even more expensive. May 2018 is the warmest month of May ever recorded in the United States according to the National Oceanic and Atmospheric Administration. It broke the long held record, which was set back in 1934, during the Dust Bowl. The average temperature recorded in May 2018 was 65.4 degrees, compared to the 64.7 degree average from May 1934. However, temperatures didn’t just increase on the average, 8,590 daily record breaking highs were set across the United States. Including a notable 100 degree temperature spike for Minneapolis on May 28th, which is the earliest date that a triple digit temperate has been reached for Minneapolis. Precipitation records for May 2018 also paint a curious picture. The May 2018 average precipitation of 2.97 inches is slightly above the general May average of 2.91 inches. However, more than one-fourth of the United States landmass were under drought conditions. Some areas even experienced record breaking precipitation, such as Florida and Maryland. This data aligns with recent information from NASA, which foresees wet areas getting wetter and dry areas becoming drier due to a combination of human impact, natural water cycles, and climate change. By-in-large, spring weather has been arriving earlier each year in the United States. For instance, the frost-free season was 10 days longer between 1991 and 2011 than it was from 1901 to 1960. This may come as a shock to Midwesterners, who saw several inches of snow fall this Sunday, April 15th. So what’s going on? Among some other factors, the Greenland Block has a lot to do with the snowy spring of 2018, according to Dr. David Mechem of the University of Kansas. Mechem, a professor of geography and atmospheric science, explained that there is a persistent atmospheric area of high pressure above Greenland which funnels cold air from the poles straight into the mid-latitudes of North America. He told KCUR that the block was in place throughout February and March and is finally starting to break down, which would bring long-awaited warmer temperatures to the midwest. Further research is needed to establish exactly what kind of effect climate change has on spring weather, but scientists are noticing some changes. Winter storms (even if they happen in April) have increased in frequency and intensity in the Northern hemisphere since 1950 according to the National Climate Assessment. Nor’easter winter storms plague the eastern U.S. and are caused by the the cold air from the Arctic and warm air from the Atlantic interplaying. This year, that region of the U.S. saw several Nor’easters in very quick succession, which is unusual. A recent study in the journal Nature Communications found that as the Arctic’s climate continues to warm at an alarming rate, winter storms becoming more likely in the eastern U.S. The good news is that as the Greenland block continues to break down, residents of the mid-latitudes can expect spring to finally arrive. The bad news is that unpredictable spring weather can be expected to continue coming years as the climate continues to change. A recent poll found that Americans have become even more polarized about climate change in the last year. Gallup completed the poll during the first week of March using a random sample of 1,041 adults in the United States. While concern about global warming is still at a record high, the difference in opinions between Republicans and Democrats is now more stark. The poll found that 69 percent of Republicans thought that the seriousness of climate change is generally exaggerated in the news, while just four percent of Democrats believed the same thing. Similarly, just over 40 percent of Republicans said that they believe the undisputed fact that nearly all scientists believe that global warming is taking place, while 86 percent on Democrats did. Despite evidence that the number of severe weather-related deaths has risen because of climate change, few members of the Republican party seemed to think that climate change would pose a serious in their lifetime. Just 18 percent said that there was any real risk to them. This year, Gallup has categorized about 48 percent of U.S. citizens as concerned believers in climate change, which is similar to 2017’s 50 percent figure. About 32 percent have mixed opinions about the existence and cause of climate change, and 19 percent are categorized as climate change skeptics. Per tradition, many will head to a pub for a beer tomorrow to ring in St. Patrick’s Day. Few, however, are likely to think about the way our changing climate impacts beer production. Beer is made with a fermented grain, namely barely and hops, and water. All these key ingredients become more difficult to source as weather becomes more extreme. More than seventy percent of hops, which give some beers their bitter flavor, are produced in Washington state, specifically in the Yakima Basin. NOAA National Centers for Environment Information reports that in 2015, that area of Washington faced severe drought conditions from June through August. In fact, hop’s whole growing season in Washington that year was uncommonly warm. The state still managed to produce nearly 60 million pounds of hops, but yields for certain varieties of the grain were much lower than expected. The warmer weather in that region is expected to continue hurting hop production, specifically European varieties that are grown there. New Belgium and Sierra Nevada are among many breweries that have implemented internal energy conservation practices. Sierra Nevada uses more than 10,000 solar panels to supply energy to its California brewery and New Belgium employees started giving up their bonuses to purchase wind turbines for the company over twenty years ago. As grains, water and energy become more costly, brewers and consumers alike may benefit from considering the ecological impact each pint of beer has this Saturday.